9.8" x 7.6" stitched on 14 count. 7.6" x 5.9" stitched on 18 count. Cooking Rule cross stitch pattern... 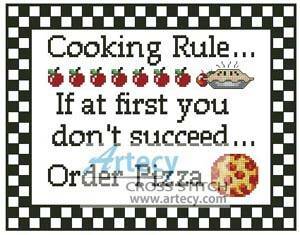 This counted cross stitch sampler pattern which says "Cooking Rule: If at first you don't succeed....Order Pizza" was created by Artecy Cross Stitch. Full cross stitches, Quarter stitches and Backstitching are used in this pattern.